Back in April, Yu Darvish treated us to one of the greatest performances we'd seen from a Rangers pitcher against the Houston Astros. Today, he was at it again, and once again, came just short. It feels a bit unrefined to mention it since Darvish did end up allowing a hit, a one-run home run in the 8th inning, but the performance of home plate umpire Ron Kulpa left a lot to be desired today. In short, he disgraced the game of baseball. Yes, he blew a strike 3 call that would have ended the 6th inning and kept the perfect game alive, but those things happen. No matter how much we beg for replay to help with the issues or for umpires to be unbiased (Kulpa, a St. Louis native and Cardinals fan was also the umpire that led to a 2011 Game 3 loss in the World Series), it seems that day may never come. With that said, the way in which he baited A.J. Pierzynski and subsequently ejected him from the game was disgraceful, and if Major League Baseball doesn't publicly reprimand Kulpa, it sends a clear message that Bud Selig and company simply don't care that umpiring has increasingly become a major problem. I've long felt baseball game -- as with life -- don't exist in a vacuum, and thus there is no way of knowing that Darvish would have still given up the home run had Pierzynski not been ejected. What I do know is that Pierzynski has now caught two of Darvish's best games, and with the short-fused ejected, Kulpa forced the Rangers to roll with Geovany Soto behind the plate. Regardless, Darvish was at the top of his game, and his performance kept Texas atop the AL West for another day. 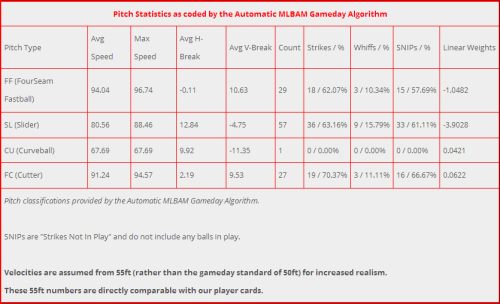 Darvish mixed a healthy dose of fastballs, sliders, and some curveballs that were marked as cutters in the chart above. 15 whiffs and 64 SNIPs were indicative of the type of stuff he was dealing today. Although he didn't get the perfect game or the no-hitter, he left the Astros once again wondering just what is it they need to do to get a hit off of him, and the Rangers are now 69-50, have won 8 straight, and 12 of their last 13. All things considered, a good day for Texas Rangers baseball with a 2-1 victory.